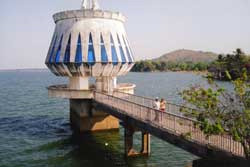 VietNamNet Bridge – Being a citizen of the North, I've always been curious about people, life and the countryside in the South, but it wasn't until I was in my 20s that I had the chance to visit one of the most popular tourism destinations in Tay Ninh Province – Dau Tieng Lake. 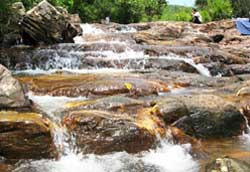 Stepping stones: Truc Stream attracts people for not only its natural and wild beauty but also because of its fresh and cool environment. From Dau Tieng Lake, my friends and I walked for about 5km through the rubber plantation and reached Truc (small bamboo tree) Stream, which runs down from Mt Cau into Binh Duong Province's Dau Tieng District. Leaving the maze, we reached the giant's stone bed which covers an area of about 3sq.km. The ‘bed' is covered with natural wrinkles that local residents say were made by the giant as he tossed and turned in his sleep. "I have been taking photos here for a long time but it wasn't until 2003 that the area becoming a popular tourist destination for local residents and those from neighbouring Tay Ninh Province," said Nguyen Van Den, a photographer. "Some of them even enjoy skinny dipping. It looks funny but it feels great to escape the hot weather in the cool water," Den said and laughed.